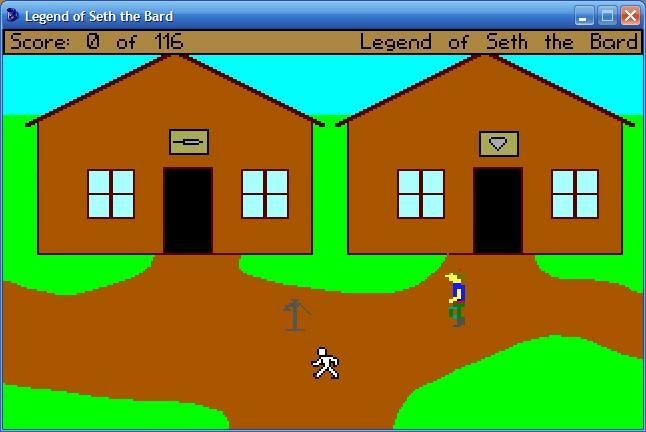 You are Seth the Bard, in a town that is haunted by a vicious and legendary Red Dragon. Many knights and sorcerers have trained and quested to kill this red demon. Some have boasted to have killed the dragon, but every time the lie has been discovered when the red beast fly’s over the town and burns the village in a fresh blaze of fire. However, most prospective heroes questing for the Red Dragon do not come back alive. After hearing the tales of those who have failed, you believe you have gained enough knowledge to seek out the Red Dragon yourself, and end its reign of destruction once and for all. You set out on your quest with your trusty lute, a strange Crystal Shard that has been left to you by an old Mage long ago, the knowledge of the location of the Dragon's Den, and your desire to free your friends and home of the dreadful beast. "A decent stab at a short King's Quest-esque adventure, despite very primitive graphics and somewhat vague goals."